WSG offers countless opportunities for firms and professionals to continually leverage the network. Over the next few months, WSG will feature blog posts on “How to Leverage the WSG Network” through marketing, news and articles and networking. Whether your firm has a specialized person or a whole team in charge of marketing, it is a critical component of being part of WSG, and there are numerous opportunities to better leverage the WSG network from a brand standpoint. Updating your firm’s information on the WSG website is as simple as it sounds, yet it has an invaluable impact on your presence and influence across the network. Take a look at your Firm’s Overview on the WSG website. Does your profile mirror the most important information and updates on your own site? What additional content and key words can you include to drive more traffic, improve search engine optimization and increase profile views? Finally, make sure your firm’s most recent logo, contacts and areas of practice are reflected on the WSG website. These are easy changes and updates to ensure your firm’s messaging is consistent, relevant and engaging. In addition to updating your firm’s information, it is equally important for professionals to maintain their individual WSG profiles. Each updated professional profile provides additional content that can enhance your firm’s visibility, leadership and search results from viewers within and outside of the network. Are your professionals, their headshots and descriptions up-to-date and congruent with your firm’s current website? Are their Areas of Practice, affiliations and successes highlighted? Each professional has a unique profile that can easily be updated and maintained to gain the most value for your firm. Take a few minutes right now to log in to the WSG site and review your own profile. Your firm is a member of a premier global network. When clients are looking to hire a firm, they want to know that they are working with an industry leader who can offer comprehensive services and resources as their business needs change and grow. Showcase your WSG membership and industry influence by adding the WSG logo and description to your firm’s website. Do you have an affiliations page? Make sure WSG is featured there and on your company’s homepage. As a member of a premier global network, this is an easy way for your firm to increase your credibility and influence globally. Find WSG’s logo and messaging in the Knowledge Center, and be sure to feature your prestigious membership in WSG. WSG’s Knowledge Center is a valuable resource for professionals, marketers and partners alike. The information and materials provided on this page have been designed to help firms best leverage their network affiliation across business development opportunities, presentations and communication channels such as websites, ranking authority listings, social media, marketing materials and press. 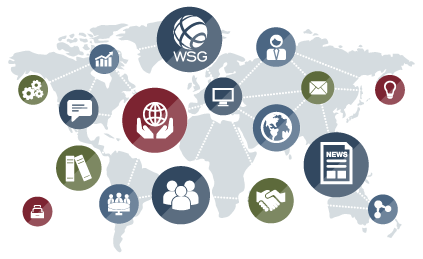 The WSG Knowledge Center offers numerous resources including webinars,presentations to include in your next RFP, brochures, WSG handbook, brand guidelines and WSG messaging. With this recent page launch, it has never been easier for your firm to leverage the network with marketing materials right at your fingertips.